The site of the new farm buildings was a green field site until ground was broken back in 2012, the first building (on the left of the picture) was completed just in time for housing that year with temporary feed barriers and gate so as we could calve the cows in that shed, all the young stock still had to be wintered of site. The middle shed was erected in late December 2012, early January 2013 but was not completed until that summer, only then having half a shed ready. 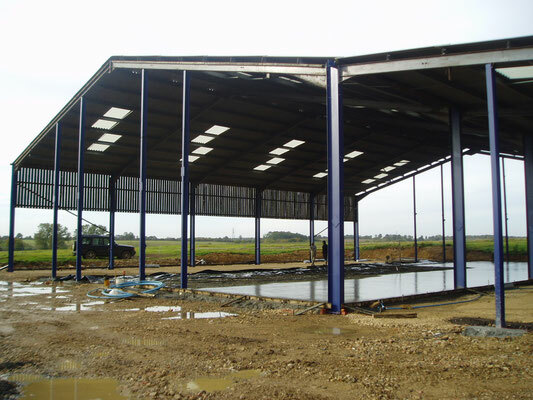 The third shed started going up in October that year with a mad push to have it ready to house the cows just before Christmas 2013, we could now house all our stock on one farm saving stress on the animals and time. 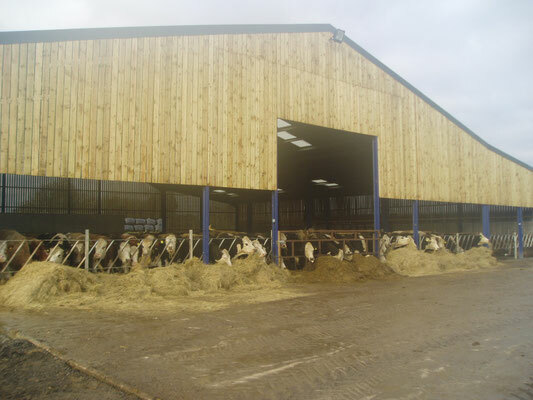 The middle and third sheds are now finished, housing all our stock in the winter with the first shed built used for feed, bedding and machinery storage. We also now have a fully operational 70,000 litre rain water harvesting system, a brilliant new handling system and a new building containing a secure office / workshop / kitchen / toilet and an automatic entrance gate for added security. We have also undertaken a huge planting scheme by moving 15 year old trees to create a spinny to one side of the buildings, a half lined drive and small tree areas at the farm entrance as well as planting a new hedge to three sides of the site. lean-to of the first shed this winter to house the bulls. Look at more photos of the build in our photo gallery under New Build.